The next industrial revolution is well underway at a new research precinct that draws together advanced manufacturing technologies with the potential to change our world. A three-dimensional rampart of titanium sand rises, mesmerisingly, like a grey beach sculpture on a rotating plinth. The fine grains of alloy are being placed and fused by a laser beam flashing from a dancing robotic arm. The structure steadily forms inside an enclosed cubicle. It is an engine, destined to power a jet aircraft. But unlike all preceding technology, this is a single piece of metal, its structure built up by successive layers of alloy granules being fused into position by the robotic arm as it responds to its digital instructions. 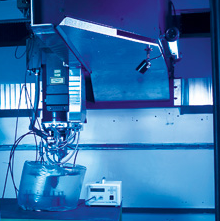 This is 3-D printing, or ‘additive manufacturing’, and this laboratory-like workspace is a prime example of a factory of the future – a factory in which the machine and the operator, not to mention the initial designers and engineers, could be on opposite sides of the planet, linked by the increasingly ubiquitous ‘cloud’. For Professor Ian Smith, Pro Vice-Chancellor (Research and Research Infrastructure) at Monash University, this is a demonstration of the third industrial revolution that is heralding new manufacturing economies for countries with the research capacity to conceive and create new technologies, and the means to bring them to reality. For countries such as Australia, which have lost their traditional manufacturing industries to low-labour-cost economies, this revolution is about jumping ahead, exploiting the most advanced science to redefine what manufacturing means and what it can deliver. Facilitating this revolution in Australia is an alliance that brings together some of the country’s most advanced science bodies to create a globally competitive research capability with a stated objective of pushing out the frontiers of manufacturing technology. The Australian Manufacturing and Materials Precinct, located in the Melbourne suburb of Clayton, was formalised in late 2012 and brings a single global “shopfront” to an extraordinary suite of high-performing neighbours – a top-100 university, the Commonwealth Scientific and Industrial Research Organisation (CSIRO), the Australian Synchrotron, the Monash Biomedical Imaging research centre, the Monash Medical Centre and the Melbourne Centre for Nanofabrication (a cooperative formed by CSIRO, Monash and five other Victorian universities). Professor Smith manages Monash University’s relationship with the other precinct partners. He says the unfolding research collaboration is a pragmatic response to the intensely competitive pursuit, internationally, of new technologies and new industries. “The technologies needed to drive tomorrow’s economies are not going to come from any one organisation … so basically it was time to become more strategic in the way we offer our research capabilities to both Australian and international industries,” Professor Smith says. This is echoed by the director of the Australian Synchrotron, Professor Andrew Peele, who sees the precinct as formalising relationships that had already started to form naturally, particularly between CSIRO, Monash and the synchrotron. Dr Calum Drummond, CSIRO group executive for manufacturing, materials and minerals, says the precinct pulls together not only specialist technical services, such as the synchrotron, but also complementary approaches to research. Another impetus was the rejuvenation of Australia’s Science and Industry Endowment Fund by a large injection of funds from CSIRO, based on income from the global licensing of its wireless local area network (LAN) technology – one of Australia’s most prominent global inventions. Here, the collaborative nature of the precinct was crucial: the endowment fund grants are primarily for supporting multidisciplinary and multi-institutional approaches to creating modern technologies. “CSIRO and Monash both saw that an initiative built around advanced manufacturing – ‘factories of the future’ – was where we could play to the two organisations’ strengths,” Professor Smith says. Achieving this, however, needs a research capability that extends into the absolute frontiers of science, particularly in nanotechnology and materials imaging – something the precinct provides. Its occupants also already have significant international reach, working with companies such as Boeing, Airbus, Bombardier, Microturbo, Siemens and Leica. He says an initial challenge for the precinct will be to develop an interface that allows industry to engage with it as a one-stop shop for all the research capabilities that are either within the precinct or accessible via communication portals to other CSIRO research sites or even other universities. These questions are already partly answered by a new A$8 million graphics processing unit supercomputer shared between Monash and the Australian Synchrotron. The supercomputer is the nucleus of a network that allows the imaging community across the country to be ‘plugged in’ via a cloud computing interface that provides access to the synchrotron. “It is brilliant computing, but only because of the brilliant people who are constantly being challenged to work with larger and more complex data sets,” Professor Smith says. The goal now is to encourage industry to work with these skills and technical resources. “If we can deliver superior products from our technologies, then industry will be more willing to partner us on bigger and bigger projects.